…and Ritsuko MAY be one of them. Yes, I’m recycling a post title joke from like a month ago. I never claimed to be all that original. Anyway, I think I may have to be done with Idolmaster: Shiny Festa. 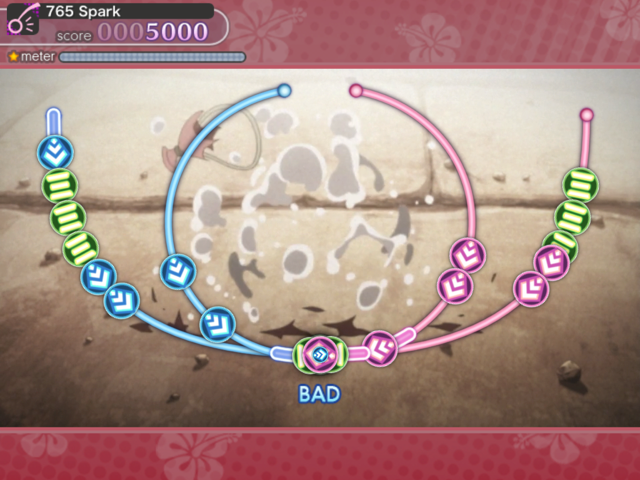 I managed to beat the campaign mode, I managed to get FULL COMBO (caps are important, yo) on all songs on Normal mode, I managed to get an A rank or better on all songs on Pro mode, unlocking every song on Master Mode, I managed to get A rank or better on about half of Master Mode… and then my wrists gave out. You have multiple tracks coming towards the target and the notes from the separate tracks are actually interleaving. This is one of the more polite ones, even. The A ranks that I did get were largely a result of just hammering both sides of the screen at once as fast as I could, and praying that it would register the taps as being on the right sides of the screen. This is not good to do to your joints 🙂 So I may need to call this the point where I rest on my laurels and call this one beaten. This entry was posted in Idolmaster, iOS. Bookmark the permalink.